I have to get back to the client with a reasonable price per minute and am unfamiliar with the actual industry standards for stopmotion animation. Just curious if anyone would have any suggestions for what to charge per minute for animation like that. Its long term work, being 1-2 minutes of animation per week, every week, so don't know if that should factor in to price or not. Thank you guys! I animate a weekly web series that runs about 3-6 minutes per episode. The company pays me $2000 for the 1st minute and then $84 for every additional 5 seconds. Definitely factor in the pricing and the duration of your work. I've been animating non stop for the past year and a half, and it's quite taxing, especially since I have to do everything from set-building to the final post-production edits myself. Right on, thanks for that info man! Do you seriously animate up to 6 minutes a week!? Thats an insane amount of work. I was stressing out over a minute and all the work behind that. But $2000+ a week is really good money. Do you have a link to the page your videos are posted on? Sure~ The company markets these toys called, Stikbots. My job is to basically make them an action series with their products. Great work, Moonshine! Really terrifying...is that what kids watch these days?! An approach to working out how to charge is called cost-plus. This is where you work out what it costs you to make the product, then add your time plus a bit to go back into the business. Sounds easy, but most people underestimate their overheads - such as the cost of the space (annual rent / the number of weeks you are expecting to work, if calculating weekly costs). You have to include everything, heating, lighting, equipment depreciation (you don't want to finish the job with clapped-out gear and no money to replace it with). Often freelancers come up with a figure that seems too high, then cut it back so as to get the job. The danger with this approach is committing yourself to a contract that actually loses you money - believe me, I have seen it happen. So do not judge a 'fair' amount by your own standards. Look at the company hiring you and try to judge by their expectations. My experience is that companies like a bottom-line quote if possible, so they know they are not liable for more than a certain amount. But again, this could cost you if you haven't done your sums or costs out of your control go up (and they will) be and there is no way of passing them on. Moonshine's approach therefore seems about right, although there should be a means of reviewing the charges say each year, perhaps by accepting a one-year contract and agreeing to revise it on renewal. Loading the charges for the first minute reflects the fact that you have to have all the gear and pay for the studio whether you make one minute or ten. So don't be tempted to divide the costs evenly, say for each ten seconds, as this is a sure way to not be able to pay for your overheads. Watch out for penalties if things go wrong. What happens if you fail to deliver, or it all goes sour. Ideally have a severance clause with agreed notice on either side. It goes without saying that any agreement must be in writing. Don't forget stuff like intellectual property rights and the right to use the images for your own purposes. Just to add a couple more thoughts. If you bid too low, and can't make reasonable money on the contract, you are stuck, because you can only negotiate downwards. Most clients do not want the cheapest job, they want a good job, so bid at a level that respects your professionalism. It looks terrible to have to go and confess that you can't do the job properly because you failed to do the sums right upfront. Put the $2k on the shortest time you will be commissioned for, if this is the basic amount you will charge. And be sure to allocate from that sums of money for overheads and capital replacement, e.g. upgrade to Dragonframe 4. Do not be embarrassed by charging what might seem a lot to you. Defend it with the justification of overheads and your skills. We all tend to undervalue creative skills, unlike e.g. lawyers who have no problem charging huge sums - and all they do is talk! One freelance friend told me (he is a builder and stained glass maker) that if he does not win every contract he reckons to have pitched at about the right level. If you do the cost-plus calcs as outlined above and the client says it is too high, then you will know that you cannot do their job without losing money, so stick to your figures. I don't think I could animate 6 minutes in one week! A good day is 12 to 16 seconds. But I do shoot at 24 or 25 fps on ones. A simpler style or lower frame rate could let you get more done. Some days might be 2 shots, one at 3 seconds, the other at 2 1/2 sec., with some time spent setting up each shot and tweaking the lighting. A minute a week would be hard work and possibly take some extra hours if anything went wrong and I had to re-shoot. 30 seconds a week would be easier, once everything was made and ready to shoot. I'm in Australia so actual prices may not be comparable. If you are working in your own space, the rental, tools, lighting and camera gear and computer all need to be factored in, because they cost you money. At the very least, if you desperately want to do it, you might decide you had already paid for your equipment anyway and could let that go just this once, but get a reasonable return for the hours you work on it. When I worked at daily hire rates animating on short films with minimal budgets, I worked at a very basic $230 per day. Often that day was 10 or 11 hours long, because once I start a shot I keep going until it's finished. Sometimes I was lucky and finished at 8 hours. That was at their studios, so whether I had a studio and cameras didn't come into it. Still, that's pretty cheap for skilled work, but it was for fellow animators who pretty well subsidised their own grants with untold hours of their own free labour, just to get it done. A commercial enterprise would not get the same deal. Thanks for the links moonshine. I think im already following you on instagram! And thank you too, simon and nick. I have most of my equipment already and most of my costs are minimal being mostly clay and wire and such. However i cant seem to find a big enough infinity style background that doesnt get ruined by the clay so im constantly buying a new clean piece of vinyl. Im working out of a garage a will probably be splitting a rented office unit for a couple hundred bucks. I basically agreed to $2000 for the first 1.5 minutes and $1000 for each additional minute after that each month. Its kids movies and are fairly simple at 12 fps so i can probably pump out 5-6 mins a month, which ends up being pretty decent pay, minus taxes. I normally animate at 24 fps and at best get 10 seconds. Depending on how big your set is, you have several options, and all of them inexpensive, customizable, durable, and ending with the same visual result. 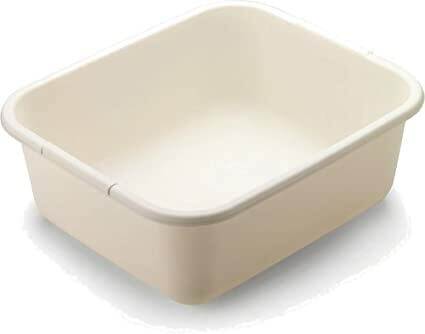 The first you might consider is a white plastic tub with rounded corners. These are available in home furnishing department stores and are inexpensive. The best part is that they are stackable, so you could buy several and if one gets ruined, you can just pull the next one off the stack. What are your working dimensions? If the first option is not big enough, here's option 2, which is a bit bigger. Been considering a seamless white background lately, and this is how I would do it. If there's too much glare from the lighting, you can use a polarizer on the camera lens and tame the shadows from the lights with parchment paper (withstands at least up to 400 degrees in an oven). Edit: You may have to modify these tubs somewhat with a box cutter. Didn't mean to get too off topic, but just wanted to show what you can do on a low budget. That tub cost me $5. A cyclorama for professional photography can cost between $100 and $300. The lower your overhead, the less you have to charge your client, if we're talking about only the materials part of your project budget. The above example could have been done much cleaner, I just "MacGyver'd" it together in 10 minutes as a proof of concept with whatever was available. "Congratulations on the workshop! The online one sounds interesting as well but alas, I don't…"
"lol John is it a teaser trailer ;)"
"hey nick thanks for your quality feedback, I really appreciate it. that was my concern about…"
"I usually go straight ahead and by feel, and it takes however many frames it takes. So I take…"